state parks, and find new ones! The ParksByNature Network (PBN) works directly with state park systems to provide updated, accurate visitor information guide you through your park visit via the Pocket Ranger apps. Enhanced features allow you to keep track of your hikes using GPS and GIS technology, share points of interest, and keep track of friends using the "friend finder" feature. And of course, you can share photos you take at your favorite state parks. 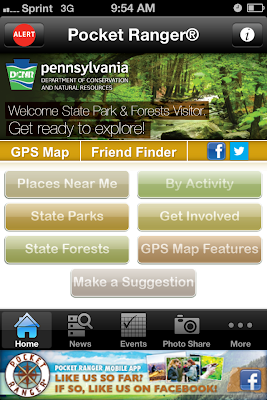 I've used the Pennsylvania and Delaware State Parks and Forests Guides to help prepare me for park visits, and they're just great sources of information. The best part? They're free. For my first contribution to the Pocket Ranger blog, I cover three winter sports I want to try as a follow up to the snow biking 101 post on Adventure-Inspired last week. Enjoy, and thanks for reading! How exciting. This is awesome!